It is a cynical rule of politics that, if you get people sufficiently scared and confused, many can be persuaded to agree to some of the worst and most irresponsible ideas. Case in point, the threat that has emerged this week from Senate Republicans, who are using fear and misunderstanding about wildland fires in our forests, as well as the impending expiration of government funding on December 11, to pressure Democrats to attach very environmentally destructive logging provisions as a “rider” to the Omnibus appropriations act in the coming days. The logging provisions, passed earlier this year by House Republicans as part of HR 2647, would override federal environmental laws and use “Categorical Exclusions” to exempt logging from any analysis or disclosure of adverse environmental impacts, with the goal of dramatically increasing logging, and post-fire clearcutting, on our National Forests and other federal public lands under the deceptive guise of “fuels reduction”, “thinning”, and “salvage” logging. Specifically, Senate Republicans, and their timber industry allies, are pressing to attach the logging provisions to a “fire-borrowing” measure that would prevent the fire suppression program from borrowing non-suppression funds from other programs during fire season. However, the proponents of the logging rider are seriously misrepresenting current science. The truth is that, despite the self-serving message of fear and misinformation coming from the timber industry and its campaign contribution recipients in Congress, we do not need to be afraid of fire in our forests. 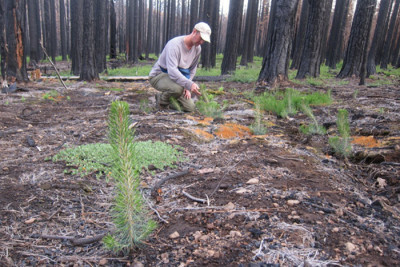 Wildland fire is doing important, beneficial ecological work in these ecosystems, and allowing more fires to safely burn in remote forests would improve wildlife habitat, and would also free up resources to focus more on protecting homes from fire, and helping homeowners implement proven and effective measures to make their homes more fire resistant in rural forested areas. What you can do: Call the Capitol Switchboard at 202-224-3121, ask to be transferred to the office of each Senator, and leave a comment with the environmental aide for each of them, urging Senators and Congresspersons to stand firm and oppose any logging bills from being added to spending bills.